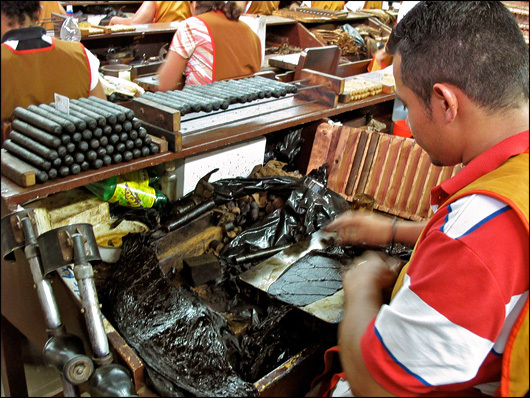 The Magic Behind Maduro Cigars. Oscuro cigars in the making. Cigars come in many colors. From Kermit green to midnight black, cigar color is the result of fermentation…or so we are led to believe. 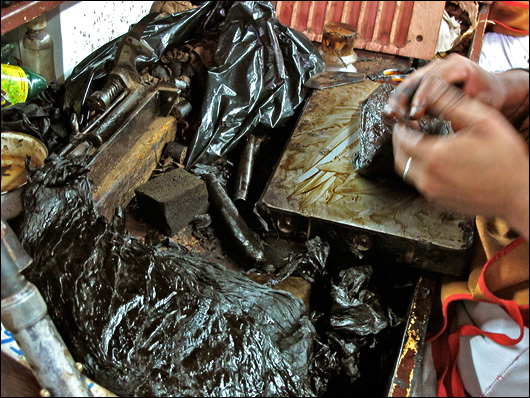 In order to fully understand how a maduro wrapper is made, we have to look into the dark side of cigar making. 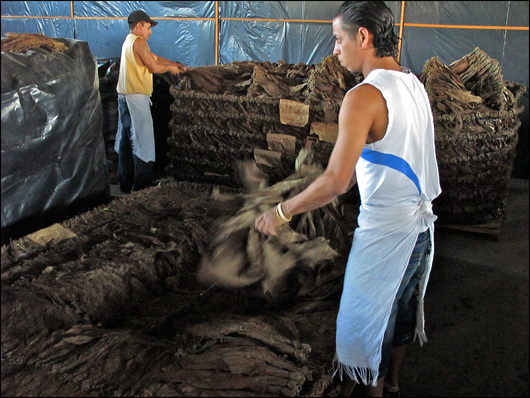 Although it is generally true that fermentation determines tobacco color, to get a cigar as dark as oscuro (almost black), simple fermentation is not enough. Fermentation is controlled decay, and the great cigar makers have perfected the process over many generations. The methods are universal throughout the industry: first the tobacco leaves are moistened and arranged in big piles called pilones. The moist tobacco then breeds bacteria, which produces heat, carbon dioxide, and ammonia. When the heat reaches a certain temperature, the pilones are taken apart and reassembled. Then, a second fermentation stage takes place. This continues until the there is no more trace ammonia and the tobacco is deemed ready for cigar production. Re-assembling a pilone for a second fermentation stage. At this point the tobacco is fully fermented. In order to darken and “sweeten” the maduro leaves, some cigar makers resort to steam. 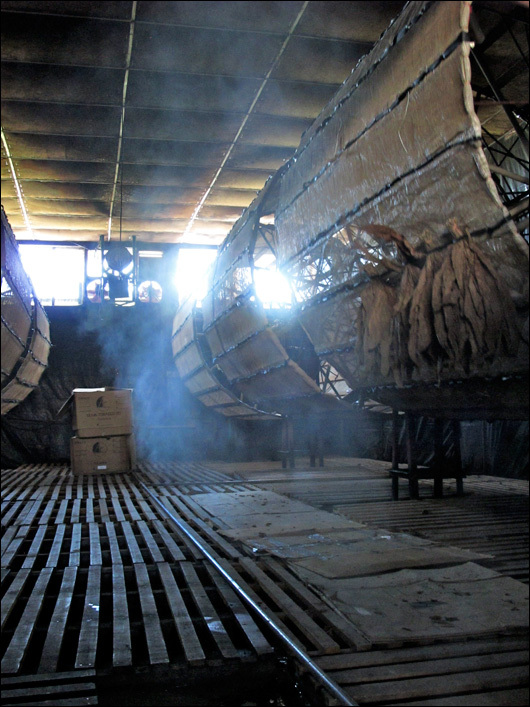 By placing the tobacco in a steam chamber, the additional heat will darken the leaves beyond that of traditional fermentation. 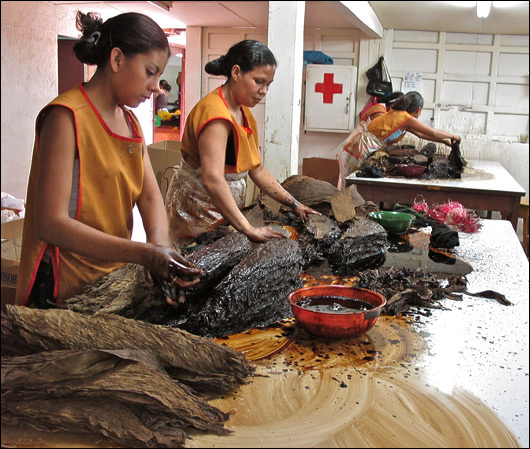 Since nothing artificial is used, this process is considered acceptable by the cigar making community. But steam will only make a cigar a shade darker, and not the black color we associate with some maduro cigars. 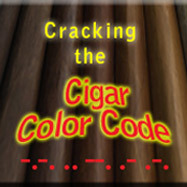 To achieve such dark shades, many cigar makers revert to “cigar alchemy”. Steam chamber darkens wrapper leaves. “Cigar alchemy” (my own term), is the secret manipulation of the maduro wrapper. First let’s talk about the use of a catalyst. When extra fermentation alone doesn’t do the trick, a sugar solution can be used to “push” the fermentation to the next level. (A cigar maker inadvertently confirmed this to me.) To my palate, the use of sugar causes the wrapper to lose its subtle tobacco flavors. I sometimes find maduro cigars to be less complex than their “natural” counterpart. Yet some maduro cigars have tremendous flavor. To achieve this, many well-established cigar makers take the process even further. This is where the waters get a bit murky. Ever smoke a maduro and find the flavors to be herbal, in a way that no natural cigar has ever been? If so, chances are the cigar has been treated with betume (or bethune). That’s when a solution is applied to the wrapper to add flavor as well as to darken its color. Each cigar maker has its own recipe for betume, the ingredients of which are a closely guarded secret. Many cigar makers do this, but will never admit it. (Again, this information was provided by an anonymous source.) Cigar making is like prestidigitation. Magicians will never reveal their tricks, and neither will the cigar industry. But if a cigar is black and extremely herbal, chances are slight-of-hand is at work. I, for one, have no problem with the use of betume. It adds additional flavor and character to a cigar. As long as the ingredients are natural, I have no objection. “Evening the color” with tobacco juice is a common practice. Rolling with treated wrappers is a messy job. I, for one, will stay away from black cigars. To me they look unnatural. But I have enjoyed many dark maduros that have delivered tremendous flavor. The use of betume can add a lot of character to a cigar, giving it a unique flavor profile. Variety is the spice of life, and having lots of cigar choices makes smoking that much better. But I certainly understand the purist’s point of view. To them, the use of betume would be unacceptable. Certainly lovers of Cuban cigars would frown on such a practice. Of all the Cuban brands, there is only one maduro: the Cohiba Maduro 5. But the use of betume is actually a Cuban invention. Something practiced by Cuban cigar makers solely for their own personal gratification. But to those of us who appreciate the variety provided in the Non-Cuban cigar realm, maduro cigars offer a great alternative to the traditional Habano flavor. As in magic, perhaps we should not look too closely at the trick. It is more fun to be awed by the outcome, rather than to question the process. It’s always exciting to see what today’s great cigar makers are going to pull out of their hats. I agree have no problem with the method as long it is a natural ingredient. I’ve enjoyed some very good and black Gurkha cigars. Damn fine article. Some think that if you get stain on your finger, that it is dye. I can mention almost all maduro cigars will do this. But why would they even want to paint a mottled leaf? I don’t get that. I love a beautiful marbled wrapper. I con’t tell you why it adds to the enjoyment any more than an inch and a half of tight even ash does; but it does. It’s just a beautiful thing in your hand. Why paint that? Gimme a real leaf. By the way, I signed up for your newsletter a month back but have not gotten any. Should this article have appeared in my inbox? I’ve looked through my spam pile. I even signed up a second time with another address… no luck. Love your stuff. Keep them coming. Thanks for the kind words. I’m glad you liked the article. About the Newsletter…I usually post an new article before writing the Newsletter. So there is a day or so lag. If you want to be informed of new articles more quickly, I suggest you sign up for the RSS feed. Anyway, the Newsletter is going out today. I have experienced the color rub off with two brands of “premium cigars”. Both have a last name that begins with P.
I can’t say his name but it rhymes with “Pocky Ratel”. A jet black stick from certain line named for a 10 year period left my hands and lips stained. The remaining 5 inches of the six inch smoke were promptly chucked into the fire. Where it belonged. He seems to be great at marketing to everyone, expect cigar smokers. Great read, thanks for this informative piece. It made me take closer look at the next “big-brand” maduro that I had…indeed on close inspection it looks suspiciously even toned, wondering if it was colored… nonetheless an enjoyable smoke. I tend to prefer naturals anyway, love a good med-full bodied Connecticut-wrapped blend. Keep up the great articles, thanks Joe! 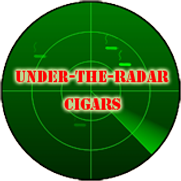 Came across this site while reading about maduro cigars. Good info. Ditto…good info, nice job. Keep it coming. La Gloria Cubana Serie R maduros are also as black as night. I used to smoke Royal Jamaica cigars when they were still made in Jamaica. They had a flavor I really liked. Since moving out of Jamaica they were never the same and no other cigar has had the flavor. I think it may be because they used to process the cigar in something to prevent blue mold – maybe bethune?? These were not dark maduro cigars so I’m thinking the bethune used was not the same as described in this article.